Chevron Mountain Villa is a simple accommodation built 70 years ago, in Kausani with some of the great views of Himalayas and Valley. Located in a mountain lodge, the villa offers rooms that are clean and cosy, nestled in a beautiful ambiance of mountains, valleys, pines and terrace farms. The villa overlooks the beautiful panorama of a 180 degree view of Himalayan snow peaks. Chevron group of Hotels is a one of the leading chain of Hotels and Resorts in Uttarakhand. The Objective of the group is to provide good and affordable accommodation with blend of modern amenities with heritage and cultural infrastructure. 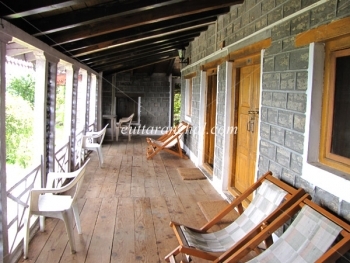 Chevron Mountain Villa is located near the View Point and is about 3 kms from the Kausani bus stand. 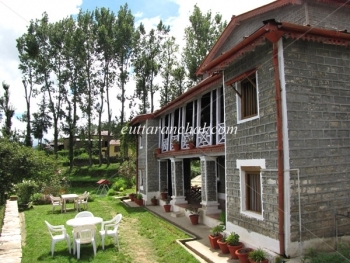 There are 9 Deluxe rooms and 3 cottages in the Chevron Mountain Villa hotel in Kausani. The rooms in this hotel are simply furnished, with wooden flooring and ditto ceiling. Amenities include a double bed, telephone, television with satellite connection, sofa chairs, wardrobe and clothes hangers. Chevron Mountain Villa has 18-hour room service and the fare on offer is multi cuisines in its restaurant. The closest airport from Kausani is at Delhi which is 405 kms away. Kathgodam has a railhead at about 130 kms which is closest from Chevron Mountain Resort in Kausani. Ranikhet is 75 kms, Almora is 50 kms, Nainital is 115 kms, Corbett Park is 150 kms, Karnaprayag is 100 kms and Kathgodam (via Almora) is 136 Kms from Kausani.